UPDATED: APR 19, 2019 Bottle picked up from REWE Getränkemarkt, Zolling and consumed at home Attenkirchen, Bavaria, Friday (Good Friday) 19th April 2019. Listening to Shaun Keavney on 6 Music. Pours hazy orange/gold with a large foamy white head. Soft in the mouth, wheatiness and yeastiness show straight away, Loz gets lots of lemon, I don't, but she is comparing it to her previous Weiße. Nice. UPDATED: MAR 1, 2019 Can at home, from an IP trade with Beer Viking, 23/02/19. Murky orange with a well presented off white head. Nose is orange peel, caramel, yeast esters, breads. Taste comprises banana, fruit peel, nice orange character, clove, breads, light white peppery spice, trace of yeast. Medium bodied, soft massaging carbonation, semi drying close. Decent well rounded hefe. UPDATED: JAN 6, 2019 Golden coulered beer with quick dissapering head. Aroma is fruity en yeasty. Taste of sweet summer fruit. UPDATED: JAN 5, 2019 Can, pours a fast-settling murky brown with a bright aroma of banana, spice and pine needles. Peppery dry bitterness over a dry-sweet creamy body, touches of lemon and resin, more banana and spice. A nice twist on a classic style. UPDATED: DEC 16, 2018 Super hazy golden and peach coloured body with a thinnish, single centimetre tall off-white head that fades quite quickly. Aroma of grass, hay, light cleanser and a dose of lemons and a touch of subdued spices, such as coriander seed and a dose of lavender. Light to perhaps Medium-bodied; Strong grassy and very herbal flavours show through with a deep astringent and stronger grainy and citrus note with a lot of wheat, yeast, light hay and a touch of softer sugars that start from some fruits with only a touch of the astringency and much more of the light and grassy and wheatie dry flavours throughout. Aftertaste shows the wheat, yeast, bread, light citrus and hay with still some very noticeable alcohol and grass towards the end, but the wheat and softer flavours definitely make this easy to drink. 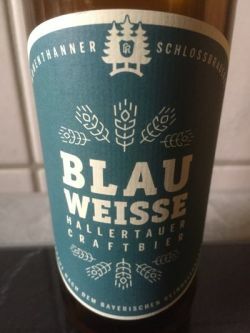 Overall, a very nice wheat beer with some softer flavours that still show some character, yet remain easy to drink and enjoyable. I sampled this 50 cL can as Day Fourteen [of twenty-four] of the 2018 Christmas Advent Calendar, purchased from Costco in Arlington (Pentagon City), Virginia on 30-September-2018 for US$59,99/twenty-four, sampled at my house here in Washington on 15-December-2018. UPDATED: DEC 16, 2018 500 ml can from the Advent Calendar. One day late! Pours a clear orange color with a small white head. A light sweet grainy nose. Of course, light metal, soft apricot citrus, husky. Pretty smooth, wheat. Solid. Really spicy, clove and coriander. UPDATED: DEC 16, 2018 Advent Calendar: pours hazy orange with a white head. Aroma is banana and some spiciness. Taste is sweet and sort of spicy. Pretty light. Not bad. UPDATED: DEC 15, 2018 500 ml can from the Advent calendar. Aroma is banana, bubble gum, clove, earth. Pours hazy golden with a one finger bone-white head with decent retention. Tastes sweet, spicy, lightly acidic; flavors like the aroma descriptors, noticeable alcohol. A touch watery. Overall, it's pretty good.